The 1st Quarter IFTA Filing Deadline is on April 30th. Start Your IFTA Report Now! Easily generate your IFTA quarterly fuel tax report with accurate fuel tax calculations. Use our IFTA online software to create detailed reports with your distance, fuel records, and miles traveled per jurisdiction. ExpressIFTA also provides IRP reports, so you can easily track your mileage per jurisdiction. You don't have to remember the IFTA tax rate per state each quarter because regularly we update them for every jurisdiction. No payment is required until you generate or print your IFTA report. The FMCSA initiated the ELD mandate rule as part of the Moving Ahead for Progress (MAP - 21) order in hopes of creating a safer work environment for drivers, and a faster more accurate way to track, manage and share trip (RODS) data. How does the ELD mandate impact IFTA reporting? Prior to the ELD mandate, drivers were required to manually track and supply odometer readings from the start to the end of their trip. This manual reporting made tracking and calculating trip details complex. To combat this complexity, the ELD device monitor and records your odometer, distance traveled, and fuel records making IFTA fuel tax reporting easier and more efficient. Does the ELD mandate have you feeling nervous about IFTA reporting? Don’t worry, ExpressIFTA supports ELD data import! All you need to do is export your ELD data, send it to support@expressifta.com, and we will convert your file (pdf, csv, xls) into a supported ifta report format, and upload the data to your account with our bulk upload feature. If you have any further questions or concerns regarding the ELD mandate and IFTA fuel tax reporting check out our blog section, help videos, or give us a call at 704.234.6005! 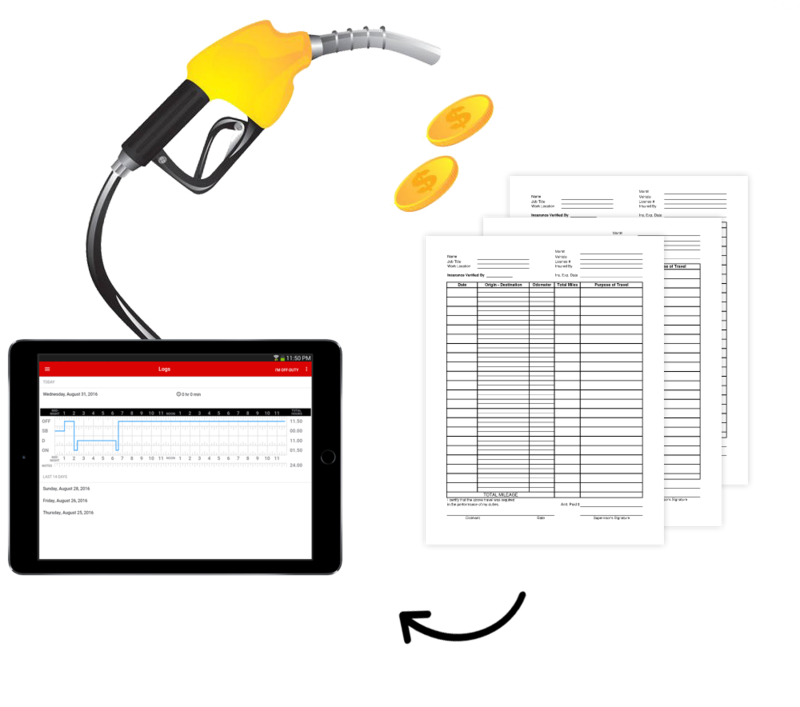 ExpressIFTA is the most convenient way to track all of your fuel records and generate your quarterly fuel tax reports online. The process is simple, just follow the step-by-step guide to enter your business details, vehicle information, and fuel records to generate your report. ExpressIFTA also provides IRP reports, so you can easily track your mileage per jurisdiction. You can even instantly upload your records with your GPS data or use the quick entry screen to enter your odometer readings, and we will accurately calculate the amount of IFTA fuel tax you owe for you. Also, you can maintain and organize distance/fuel records per vehicle or driver. ExpressIFTA is so detailed that you can even monitor your totals per fuel type. There's no easier way to generate your quarterly IFTA reports and track your IRP mileage. Some states require you to submit your IFTA return in a PDF format to your base jurisdiction, while other states require you to complete your IFTA return online. That's why ExpressIFTA provides a PDF format and online worksheets. You can track your totals with an offline PDF format to print and submit to your base jurisdiction to complete your return, or use our online worksheets to track your totals per jurisdiction. The worksheets can then be used to complete your IFTA return online. We know that taxes can be difficult to calculate, that's why ExpressIFTA automatically calculates your amount due..
A part of complying with IFTA reporting includes having an IRP or International Registration Plan. 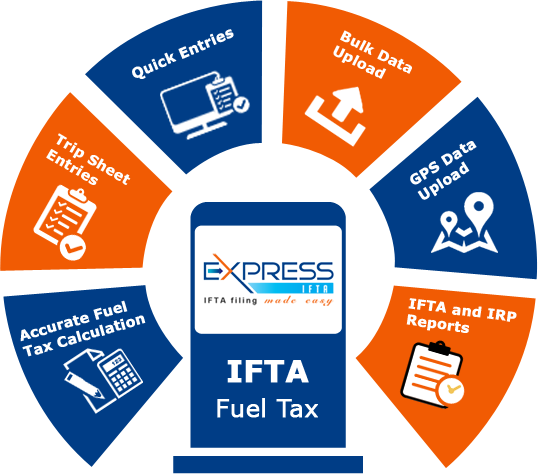 Every IFTA qualifying vehicle is required..
ExpressIFTA allows you to conveniently Bulk Upload all of your odometer or distance records at once with an Excel or CSV.. While reporting IFTA it's easy to make simple mistakes, but with our IFTA reporting software, you don't have to worry. Our pre-auditing..
Ease, and quality of the end result in a timely manner. I love doing business with this company! I wouldn't consider another. Very professional.